This DIY ELISA is a Do-It-Yourself Development kit that contains the basic components necessary for the development of sandwich ELISAs to measure natural and recombinant Mouse Interferon Lambda 2/3 (IL-28A/38B). DIY kits are intended for the analysis of cell culture supernates. Other matrices need to be evaluated on a case-by-case basis. When used according to instructions and recommended materials, each DIY kit contains sufficient materials to develop approximately fifteen 96-well ELISA plates. 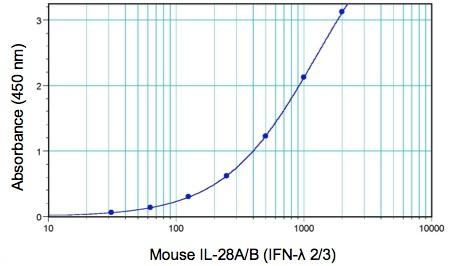 IL-28A, IL-28B and IL-29 are a recently discovered class II cytokine family that displays similar properties to type I interferons (IFNs). Similarly, they have been shown to function by signaling through the JAK-STAT pathway, upregulating the expression of genes involved in controlling viral replication and cellular proliferation. Consequently, they have also been described in the literature as lambda IFNs (IFN-λ1 [IL-29], IFN-λ2 [IL-28A] and IFN-λ3 [IL-28B]) or collectively as type III IFNs. Additional studies have shown that both type I and type III IFNs are upregulated during viral infection, suggesting each may have similar and perhaps distinct roles in controlling the host response to pathogens. All type III IFNs signal through a heterodimer receptor complex comprised of the IL-10R2 and the IL-28αR receptor chains to initiate the signal transduction cascade. In contrast, all the type I IFNs (α, β, ε, κ ,ω) initiate signaling by binding to the IFNAR1/IFNAR2 receptor complex to promote signaling. IFNAR gene knockout studies have indicated that type III IFNs cannot effectively maintain a potent antiviral response. In contrast, IL-28αR knockouts showed little effect on the overall antiviral response, suggesting that the role of type III IFNs may be more selective to specific cells and viruses. However, either receptor knockout showed a strong reduction in reducing viral load when mice were treated with TLR3 and TLR9 agonists. Therefore, it may be possible that the type III IFNs have been evolutionarily conserved to combat pathogens that target specifically the IFNAR receptor complex or other unique aspects of the classical type I IFN pathways. Sheppard et al. (2003) Nat. Immunol., 4:63-68. Kotenko et al. (2007) Nat. Immunol., 4:69-77. Onoguchi et al. (2007) J. Immunol., 282:7576-7581. Ank et al. (2008) J. Immunol., 180:2474-2485. Ank et al. (2006) JICR, 26:373-379.